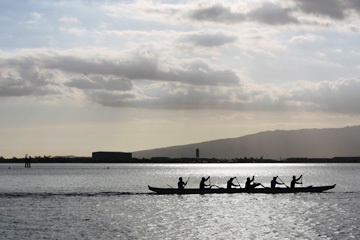 The Healani Canoe Club men's crew practiced near Sand Island Beach Park on Thursday. Like many other clubs on Oahu affected by the heavy rains and resulting water pollution in the spring, the Healani Canoe Club could have easily raised the white flag before the summer regatta season. When: Tomorrow, 8 a.m. until about 5 p.m. But it has not, and will not. Instead, as always, the club will kick off the Oahu Hawaiian Canoe Racing Association regatta season tomorrow by hosting the 60th annual Clement D. Paiaina Regatta at Ke'ehi Lagoon. Sure, the club's numbers are way down from most years. The paddlers who did return started practicing about a month and a half later than some clubs, and had to move from their traditional Ala Wai Canal site to Hawaii Kai then eventually to Sand Island. It has been a struggle to keep morale up. But Healani still plans to compete in 21 of the 37 races tomorrow, win as many of them as it can and, most importantly, have fun. "If there's any year to take a break -- because paddling takes a lot of time and dedication -- this would be the year," said Healani head coach Kealii Paiaina, grandson of Clement D., one of the club's original founders and its president until his death in 1991. But "we had loyal paddlers from all over," he continued, "and those have been kinda the ones who have stuck it out. What I'll mention to them just before the first regatta is, 'We are behind, but throughout this whole season we'll improve.' And, hopefully, we can make some points (toward state championship qualification) early on. It's a challenge this year, and hopefully it drives our paddlers." After a 2005 season in which the club enjoyed its largest number of youth paddlers in about 10 years and its strongest men's crews since Grandfather Paiaina's passing, both groups have dropped off significantly. The Paiainas and other coaches have had to pick up and drop off many of the kids willing to train at Sand Island -- in addition to trying to practice, themselves, afterward -- just to maintain the youth program. Healani is entered in six kids races tomorrow, instead of the typical nine or so. Still discouraged, perhaps, by the sewage spill at their Ala Wai home, some of the men have preferred to train alone in one-man canoes and have only started to come to regular practices at Sand Island in the six-man boats. "Sometimes, we just think, 'Well, we'll just toss up the season -- it's what a lot of the other clubs are doing,' " said Pua Paiaina, club vice president and Kealii's sister. "But we're going to continue to do what we do every year: go out there and do our best. Paddle hard. If we don't do well, then the next race we have to try harder. Give it all we got and just have fun doing it. If we're not having fun, it's not going to work -- my grandfather always stressed that." The Healani leadership is holding on to hopes that, with the start of racing again, more paddlers will be encouraged to join the ranks. While coaches and paddlers are only beginning to get accustomed to training at Sand Island, they also have to wonder where they will practice once the summer ends and the park closes earlier. For now, their immediate tonic will be the celebration that is the Paiaina Regatta and the start of another OHCRA regatta season. "I think it's always the perfect way to start out the season," Pua Paiaina said. "I think it's a great way to honor my grandfather because he was someone who had the passion for canoe paddling. My son actually started paddling this year, and, at first, he was kind of skeptical. But I told him, 'You know what? It's in your blood.' And now, that's what he tells the other kids."